Each year, public land managers make decisions regarding restoration and rehabilitation actions that influence landscapes and ecosystems. Many of these decisions involve soil and vegetation manipulations, often known as land treatments. Land treatments include activities such as removal or alteration of plant biomass, seeding burned areas, and herbicide applications. These treatments were historically planned on a case by case basis with decisions about implementation approaches, methods, and operations derived from personal experience of past successes or failures. Modern adaptive management strategies strive to capture this local knowledge through time, both locally and regionally. In 2017, the U.S. Geological Survey partnered with the Bureau of Land Management to create the Land Treatment Exploration Tool to facilitate adaptive management of land treatments. 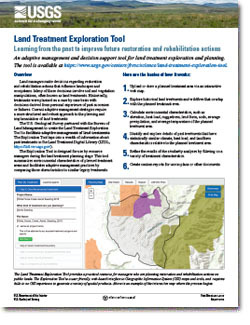 The Exploration Tool taps into a wealth of information about past treatments in the Land Treatment Digital Library (LTDL, https://ltdl.wr.usgs.gov/), a catalog of information about all known treatments on public lands administered by the BLM in the Western United States. Provisional Software Disclaimer: This software is preliminary or provisional and is subject to revision. It is being provided to meet the need for timely best science. The software has not received final approval by the U.S. Geological Survey (USGS). No warranty, expressed or implied, is made by the USGS or the U.S. Government as to the functionality of the software and related material nor shall the fact of release constitute any such warranty. The software is provided on the condition that neither the USGS nor the U.S. Government shall be held liable for any damages resulting from the authorized or unauthorized use of the software. Land Treatment Digital Library Data Disclaimer: These data are preliminary or provisional and are subject to revision. They are being provided to meet the need for timely best science. The data have not received final approval by the U.S. Geological Survey (USGS) and are provided on the condition that neither the USGS nor the U.S. Government shall be held liable for any damages resulting from the authorized or unauthorized use of the data. Due to the data collection process, data within the LTDL do not contain the most recent Bureau of Land Management (BLM) treatments. We continue to work with the BLM to update and refine the LTDL with new treatment information whenever possible. Within the LTDL, treatments that have occurred within the last 5 years may be complete, partially complete, or not entered. Please consult with your local BLM office regarding treatments that have occurred within the last 10 years for more information. The Land Treatment Digital Library (LTDL) was created by the U.S. Geological Survey to catalog legacy land treatment information on Bureau of Land Management lands in the western United States. The LTDL currently houses thousands of treatments from BLM lands across 10 states. The Land Treatment Digital Library (LTDL) was created by the U.S. Geological Survey to catalog legacy land treatment information on Bureau of Land Management lands in the western United States. The LTDL can be used by federal managers and scientists for compiling information for data-calls, producing maps, generating reports, and conducting analyses at varying spatial and temporal scales.